Israel has denounced as “shameful” Airbnb’s decision to withdraw its listings from homes in Israeli settlements in the occupied West Bank. 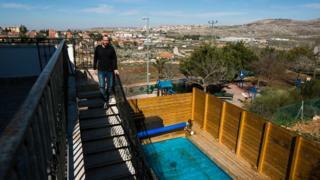 Its tourism minister said Israeli authorities would back legal challenges lodged by settlers against the US firm. Airbnb said it had made the decision because settlements were “at the core” of the Israeli-Palestinian conflict. The move, which affects 200 listings, has been widely praised by Palestinians and their supporters. Jewish settlements in territory occupied by Israel in the 1967 Middle East war are considered illegal under international law, though Israel disputes this. Human Rights Watch called Airbnb’s decision “a positive step” and urged other tourism companies, such as Booking.com, to follow suit. In a report released on Tuesday, the New York-based group said “Israelis and foreigners may rent properties in settlements, but Palestinian ID holders are effectively barred”. It said this was the only example the rights body could find “in which Airbnb hosts have no choice but to discriminate against guests based on national or ethnic origin”. Airbnb has come under fire in the past by Palestinian officials and human rights campaigners for allowing listings of homes to rent in Israeli settlements. However, Israeli leaders and organisations have widely condemned the move. And the Simon Wiesenthal Center, a US-based Jewish human rights organisation, urged Jewish communities around the world to boycott Airbnb in the wake of its decision. More than 600,000 Jews live in about 140 settlements built since Israel’s 1967 occupation of the West Bank and East Jerusalem.